The specified file public://inline-images/https_%2F%2Fs3-us-west-2.amazonaws (7)_4.jpg could not be moved/copied because no file by that name exists. Please check that you supplied the correct filename. I have commented on Target2 liabilities before. Perhaps a Mish-modified translation from the Welt article Imbalance in the Euro System Reaches a New Record will ring a bell. 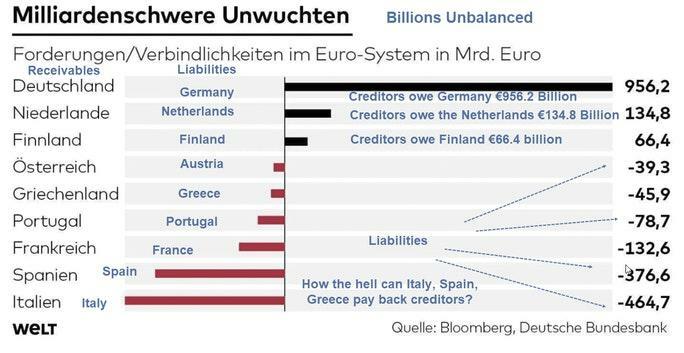 The central banks of Germany's euro partners Italy, Spain and France owe the Bundesbank almost a trillion euros . This is a new high. - more than ever before. Tendency continues to rise. There is no security for this money. Read that last line again and again until it sinks in. Italy is €464.7 billion in the hole. Spain is €376.6 billion in the hole. "Capital flight to Germany is in full swing," says Hans-Werner Sinn, longtime head of the Ifo Institute and one of the most prominent economists in the Federal Republic. As long as they are guaranteed, then hells bells, why not make more loans? Germany Points Finger at "Moochers of Rome"